SomaDetect, a Fredericton startup company aimed at making herd health decisions easier for dairy producers, has received a major financial boost from south of the border. On Oct. 5, the six-person company won the 43North startup competition in Buffalo, N.Y. The grand prize is worth $1 million and includes the opportunity for the company to open a Buffalo office. SomaDetect is developing a sensor and software system to be used in the milk line. Their new technology can detect things a dairy farmer needs to know to reduce the severity and spread of disease, manage appropriate antibiotic use, track each cow’s reproduction status, and maximize the quality of the milk heading for the bulk tanks. “I was completely shocked,” said SomaDetect CEO Bethany Deshpande of the competition win. Only a few years ago, Deshpande didn’t know much about dairy farming. “I understood how milk was made, but I hadn’t been on a dairy farm and I hadn’t seen what it took, what it was really like,” she said. It was a chance discovery by Deshpande’s father, Dr. Satish Deshpande, back in 2014 that first launched SomaDetect’s creation and Deshpande’s immersion into the agricultural world. “He’s an inventor – a biophysicist by training but he loves to tinker,” she said. While her father was working on a sensor system for somatic cell detection, he somewhat accidentally discovered that he could measure the fat content and somatic cells in milk. He’d been using consumer milk, straight out of the fridge, to calibrate his device. “It just sort of went from there,” said Deshpande. At the time, she’d just moved to Fredericton and was getting involved with the local entrepreneurial community, and her father asked her to look into commercializing the system. SomaDetect was founded in 2016, just as Deshpande’s father was able to secure a patent for his somatic cell detection system. Working with local farmers has been a huge part of the research behind their system. Deshpande said she’s been amazed by the support they’ve received from local farmers. She started with a very basic understanding of the industry. But she said the dairy farmers she’s worked with have been keen to help from the beginning. Deshpande said the system SomaDetect is developing can detect every major raw milk component that farmers are interested in, including fats, proteins, progesterone, somatic cells, and antibiotic residuals. The system uses an in-line optical sensor that relies on the principle of light scattering – a beam of directed light passes through the milk and as it encounters particles, the beam is absorbed or shifted. When interpreted by the SomaDetect software, the unique patterns created by the changes in light indicate which components are present in the milk and in what quantity. All of this is done in real time, as each cow is milked. By automatically measuring the indicators of milk quality and herd health directly in the milking line, Deshpande said the technology should allow producers to treat sick cows early and efficiently. She added that the technology should allow farmers to detect sub-clinical and clinical mastitis, ketosis, and acidosis earlier and reduce unnecessary antibiotic use. Deshpande said that spotting these problems early means that low-quality, low-fat milk won’t make it into the bulk storage tanks. It also means that producers will have access to herd health information in a new way – data and analytics can be shared with vets, each cow’s reproduction status can be detected via the milk, and new feeds can be tested for their effect on protein and butterfat. SomaDetect has one prototype of their system in place at Top of the Morning Farm in Holmesville, N.B. “Our sensor system is connected into the milking system,” said Deshpande. “We’re able to make predictions about fat and somatic cells – which are the most advanced of our algorithms – and we’re still taking samples to be able to do the comparison.” That comparison study is allowing the SomaDetect team to ensure that what their system is detecting is verifiable and trustworthy. Deshpande said the results so far have been very good. And the 43North startup competition judges agreed that SomaDetect is onto a good idea. After initially applying online and submitting a business plan and online pitch for their business, SomaDetect was selected as one of several companies to travel to the U.S. for the final competition. The prize means that SomaDetect can complete product development and focus on sales. Part of the prize includes office space in Buffalo, and one condition of accepting the prize is agreeing to move a portion of their business to that location for at least one year. However, they’ll maintain their Fredericton office and plan to focus on the Atlantic market for 2018. They hope to have the sensor and software system ready for sale within the year. “We’re hoping to sell it for about $2,000 per sensor, with one needed for every milking stall,” said Deshpande. She’s estimating the payback period to be one year and said the company has already had significant interest. 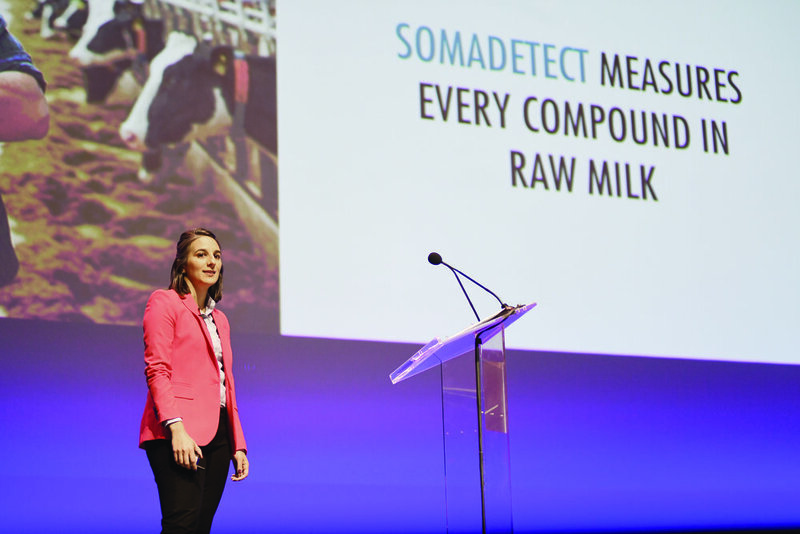 Beyond those in Atlantic Canada, dairy producers from Ontario, Quebec, and even a couple in British Columbia have already expressed interest in the SomaDetect system. “It’s really been dairy farmers who have been cheerleading our product from the start and encouraging us to continue on,” said Deshpande.